Primitive Vintage Chic Chocolate Bunny Daisy Oval Set of 3 Stacking Boxes. Love the soft warm spring colors in this set. Perfect for spring display or Easter. The cottage chic colors of sage green, chocolate brown and khaki tan were used to create this festive set for spring. The bottom box is khaki tan with a leaping chocolate bunny. 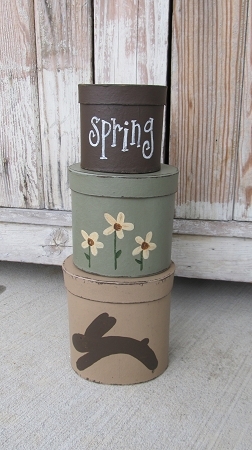 Middle box is Stonewedge Green with cream daisies, and the top box is chocolate brown with the saying Spring. Size stacked is 12"x5" and they nest up nicely for storage. Choose your saying from the list of choices. Hand painted, designed and signed by Heidi.